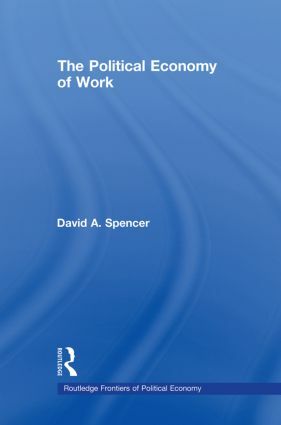 Against the background of increasing interest in the changing nature and quality of work, The Political Economy of Work offers a new and unique assessment of the theoretical analysis of work. The author challenges some common preconceptions about work and promotes an original approach to the field, contemplating the nature and development of ideas on work and its impact on human well-being drawing on such burgeoning literatures as the 'economics of happiness'. Spencer approaches the subject through a careful examination of the history of thought on work over the last three hundred years. A key focus is the development of ideas on work in mainstream economics, starting with the mercantilists and the classical economists, and continuing with neoclassical economists (e.g. Jevons, Marshall). The contributions of modern approaches including the new 'information-theoretic' economics and the new 'economics of happiness' are also discussed. The author sees flaws in the depiction of work in mainstream economics and instead draws insight from the writings of critics of the mainstream paradigm, such as the nineteenth century 'utopian' writers (Godwin, Fourier, Carlyle, Ruskin, Morris), Marx, and the old institutional economists (Commons, Veblen). The alternative approach outlined in the book stresses the barriers to rewarding work under capitalism and develops a case for radical change in the organisation of work. The book cuts across different disciplinary boundaries and is likely to appeal to researchers in a number of different fields, including labour economics, labour history, the sociology of work, industrial relations, and human resource management. It will appeal to all those who wish to promote a more critical understanding of the role that work can and ought to play in society.